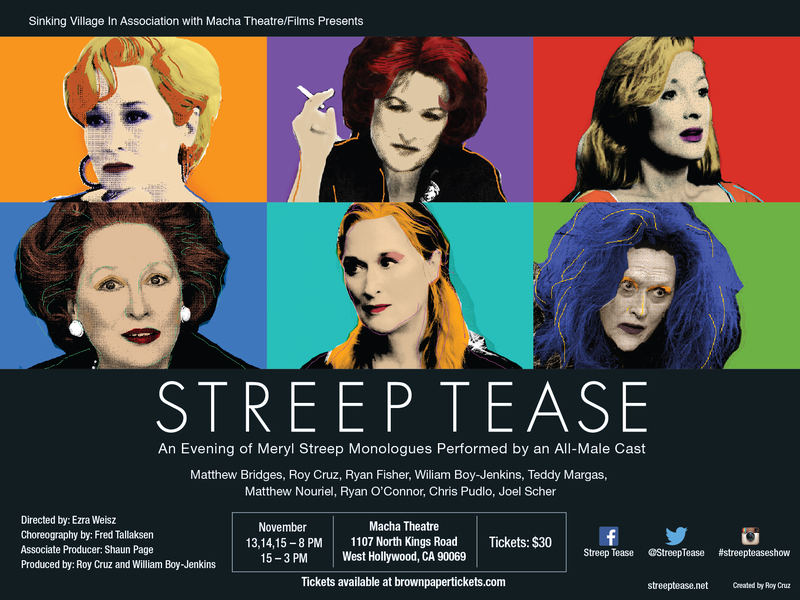 Streeptease | An Evening of Meryl Streep Monologues Performed by an All-Male Cast. STREEP TEASE: AN EVENING OF MERYL STREEP MONOLOGUES PERFORMED BY AN ALL-MALE CAST. What started out as a one-night stand in 2009 quickly became a long term relationship with the ever fascinating and brilliant actress Meryl Streep. After playing in Los Angeles from 2009-20012 and performances in San Francisco and New York, the critically acclaimed and box office hit Streep Tease is back again where it all began, in Los Angeles. Streep Tease is a show made up of male actors performing their own interpretations of their favorite Meryl Streep characters. We all love Meryl, we all have our favorite scene and there’s no better way to pay tribute to her than to channel La Streep on stage. With a new cast, new characters, more drama, more comedy, we promise to bring you the best and ultimate tribute. So join us in celebrating our inner Streep! An Evening of Meryl Streep Monologues Performed by an All-Male Cast.